This manor is located near the Northwest Gate. The wizard inside recently moved in, and might be looking to make a display of power soon. Note: Beware of a possible bug that may occur if the manor is unlocked before the quest, in which the resident will not attack at the appropriate time. This manor is the home of the widow of a late king, Ravani Llethan. 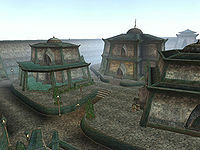 It is located in the northwest corner of Godsreach. 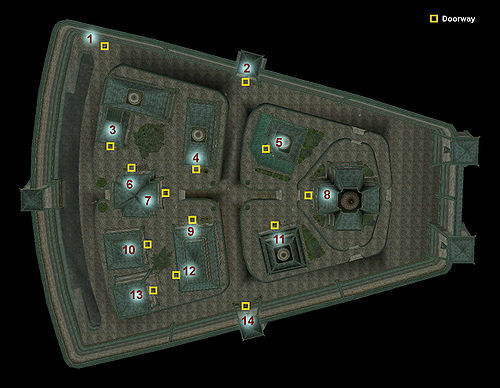 The manor must be searched for a part of the main quest to find a note. Located across the street from the Craftsman's Hall, these two manors are both in the same building. The Sadri Manor, the home of Golena Sadri, is located up a small flight of stairs on the north side. Sera Sadri has recently begun to act "mad." You can help find the cause of this strange behavior. A forgotten area of the sewers is discovered during this quest. The Thendas Manor is the home of the widow Arnsa Thendas. She currently holds the rare Droth Dagger, which should be acquired for a quest given by Geon Auline, who is in a nearby house. The Vacant Manor, contrary to its name and abandoned first floor, is occupied by Felvan Ienith, Dovor Oren, and Olvyne Dobar, who are unhappy with the state of things between them and the nobles and want to do something about it. You are told to speak with Dovor Oren to get details on their targets. The Andoren Manor, like apparently every other manor, has something to do with a spouse in some sort of trouble or dead. The quest given by the occupier here happens to have a missing husband. The reward of this is 1000 gold, so be sure to stop by to claim this sack of gold. This building is right next to the Southwest Gate and home to a pair of men. This house has two quests relating to it. One is related to the aforementioned Droth Dagger, and the other is a minor detour from the Crimson Plague quest, in which you drop off a cure disease potion to Geon Auline. This is a work hall for all crafting services. Found here are many people related to quests. One quest involves a sneaky husband's affair on the top floor. Another has to do with a crazy lady's questions about strange devices. An interesting quest involves a kleptomaniacal pack-rat (a.k.a. "The Clutter King") and his quest to find items to expand his collection. Bols Indalen offers to make custom armor for anyone who provides the materials and a fee. Next to him is Ilnori Faustus who tells you that he's simply too good be a simple apprentice and has ambitions to become an adventurer, and you must find someone to replace him. Elbert Nermarc, the enchanter, can be found on the top floor; his prices may be lowered if you return a book during a quest given by a pawnbroker in the Great Bazaar. A closed door marked "Keep Out!" will lead to a Muckraking Journalist. 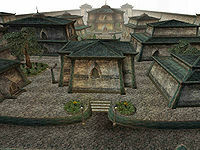 This heavily guarded building is used to display a variety of unique items to Morrowind. The museum is also willing to accept new items as part of a quest, but the current owner will be reimbursed only in part. No actual services are offered by the museum. The Winged Guar is the only tavern in the Godsreach district, and is also the location of many important (quest-related) people, so don't go on any murderous rampages here. Outside Eno Romari, a cult member, walks around. Inside is an Orc informant, Bakh gro-Sham, who has some information regarding an assassination attempt during the Main Quest. Hession, the owner of the bar, asks anyone willing to stand in for a bouncer. Ra'Tesh, the publican behind the counter, sells drinks and food. Next to the bar, Galms Seles plays a rigged game of shells. 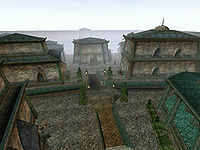 The Andoren Manor is mentioned in the official background for the Mehrunes' Razor download for Oblivion. One Firthan Andoren is contacted by the Office of the Imperial Ambassador in Caldera concerning the actions of Frathen Drothan. This page was last modified on 19 October 2018, at 20:59.